Diane Keaton has put her Spanish Colonial Revival-style mansion in Beverly Hills on the market for $11.9 million. It was built in 1927 by architect Ralph Flewelling and has 7 bedrooms and 9 baths. Keaton purchased it only 2 years ago for $8.1 million and put a lot of work into restoring it. Take a look! 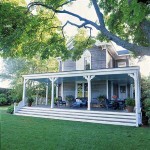 It was featured in Architectural Digest in November 2008. Keaton loves houses and is known for buying and flipping many of them in the LA area over the years. I wonder if it’s any coincidence that she has starred in so many films with wonderful houses in them? Some of my favorites include Something’s Gotta Give and Baby Boom. *UPDATE: Ryan Murphy bought this house. See how it looks now here! (Caution bad attitude alert) Maybe it’s the icy Architectural Digest style but I’m not enjoying this one very much tonight. I don’t want to be in any of those rooms even though I like the individual elements. The entrance looks like a store or a restaurant. Beautiful house, but does not look comfy at all… did you see all those wooden benches? Ouch! The giant cactus in the kitchen are saying GET OUT to me. 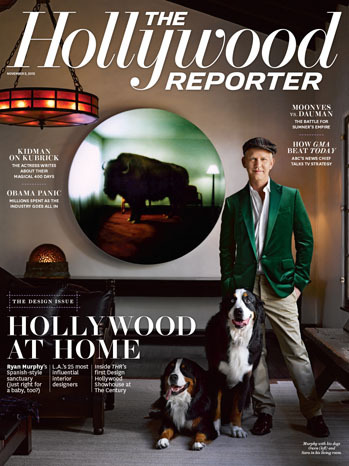 I wonder if those are normally there or just there for Architectural Digest photos? They do make the composition look really nice in the photo. I do love the colorful plates on the shelves in the kitchen. That’s a great decorating idea. Except the gigantic cacti in the kitchen. How weird – I can’t see the kitchen! I agree that it doesn’t look like there is one comfortable spot to sit. LOVE LOVE LOVE this house! But, everyone is right—no sofas or comfortable chairs? All the furniture looks like it belongs in a monastery. WOW!! Amazing home. Although – I didn’t see any comfy furniture?! Maybe thru those lush leather sofas in the library, and if I had $11.1M, I may consider…LOL! I agree about the uncomfy furniture and elements (cactus=ouch). I do love the library. The giant works on top really make the room. Beautiful home! Like others have pointed out though it really lacks a warm and inviting feeling! Deserae’s last blog post..What a mess he is! For that price does the furniture stay ? Cause some doesn’t transfer well to non Spanish style housing. Holy crap this is one of the most amazing houses I’ve ever seen. I subscribe to that magazine, but I somehow don’t remember this spread! I LOVE these pictures. 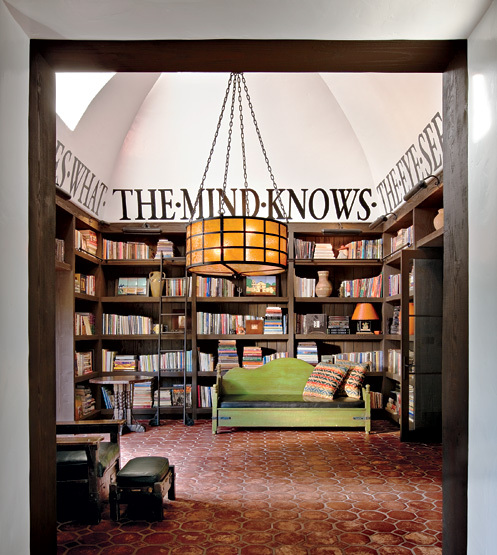 What a great quote wrapping around her library. Thanks for sharing this with us Julia! christy’s last blog post..I Chirp! I like the house but not the way it is decorated. If they left all of the colorful dishes in the dining room, I might consider buying it. First thing I would do is change out the light fixtures. Period, maybe. Too scary for me. I like the fireplace. Not much else…. She(Diane) has a great eye both for interior design and in the photography. I believe these photos are originally from her photography book. I love the style of the home from the outside. The inside, I don’t know, too cold and just not comfy home to me. I did like the library with the words going around the room.I hope she gets what she wants for it. I kinda like the cacti, maybe not on the counter, but they seem to break all the lines in the kitchen.I like the words on the wall of the library too. I’m just not a fan. I don’t like the whole Spanish Colonial style anyway, but this one really just doesn’t do it for me. Though I do love that great big red ‘3’ in the library. Love. It. Absolutely beautiful. 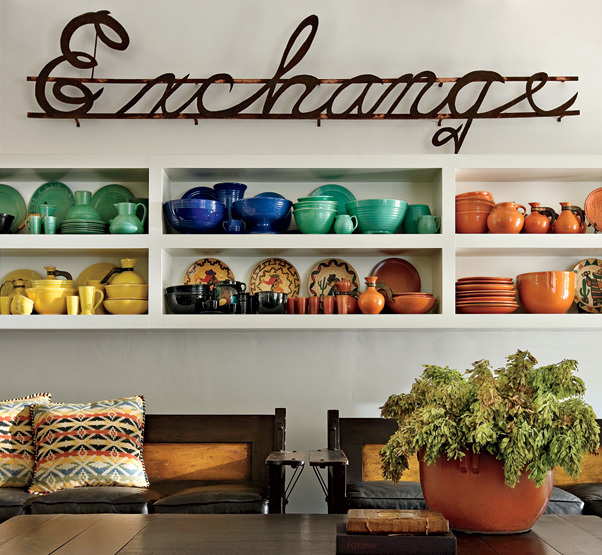 I’m lovin’ the words on the wall in her library and the exchange sign. Very classy, just like Miss Keaton herself. Becky @Farmgirl Paints’s last blog post..Golf virgin no more! It’s nice. I would rather have a place that I could feel was my own. Having someone already decorate it, it would be wasteful to redecorate. Its nice, but like someone else said. It doesn’t look like there is one comfortable spot to sit. I must be weird–but I love this one. It is my dream house really–I would just make it smaller, so I wouldn’t have to clean all that, but ohhhh how I love it. wow, that library is too die for, love it! I may be wrong, but I think it’s possible that parts of this home were used in Diane’s film ‘Hanging Up’ (with Meg Ryan and Walter Matthau). It was Meg’s character’s home in that film, though. oh my that is fabulous. . .
there are so many things that i adore in her home! As other mentioned, the furniture is just too stark. I LOVE the architecture of the house itself. Beautiful! The son of one of my mother’s best friends works w/DK on her homes. I am IN LOVE with that Library….what a fantastic space. And I love that it has that brick floor. Very unexpected. She not only has great interior design style, she also has a great fashion style. Love, love this house, the architecture, the interiors, everything works. A lot of these houses have just expensive furniture, but in this house there is more, there is soul. 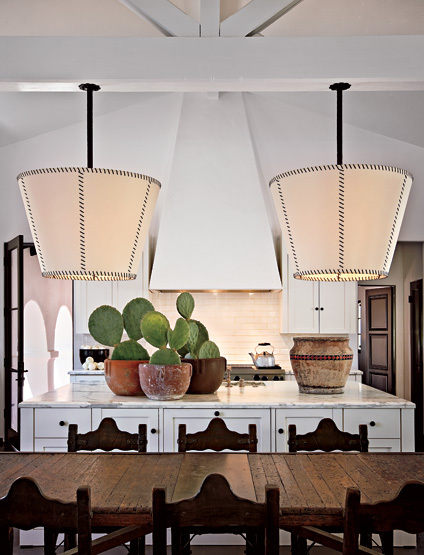 Diane Keaton’s homes have been a huge inspiration to me and to the whole revival of “Spanish Revival”. Monterey furniture is comfortable…I’m sitting in a Monterey easy chair right now. .-= Anne Winkler´s last blog ..Latest "monterey" day beds =-. I am a huge fan of Diane and and all of the Spanish Revival homes that she has restored. I love that she furnishes her homes with the appropriate furniture for the style of home! I think her homes are warm and uncluttered. A lot of people could learn from her. I love this house too fun! When I was researching Spanish Colonial houses for one of my projects, I happened to come across the November 2008 issue of Architectural Digest. Not only does it include Keaton’s beautiful home, but the homes of Humphrey Bogart and Howard Hughes in that particular style as well. You should post images of the Spanish Colonial house from the upcoming movie ‘It’s Complicated’ (directed by Nancy Meyers) with Meryl Streep, Alec Baldwin, and Steve Martin. Thanks for sharing; I’ve applied this inspiring blog post for my own. .-= Emilie Verbeek´s last blog ..Put your heart into it =-. WOW! Lovely, Spanish, and funky. Very cool. .-= Kris Smith´s last blog ..My Hero- Diane Keaton- over 65 and wearing polka dots!! =-. First of all, Monterey Furniture may not look comfy, but it sits comfy — I can curl into a sofa for hours and read, and the dining chairs I can sit in a for along time. It is a true genre of California furniture, born from Hollywood, Mexican influences, and made in Los Angeles — home! Second, the home is exquisite, and appropriately done for a modern version of this period — Heaven!